Before you start thinking about the shape or content of your learning sessions, you may find it helpful to browse through the resources in this 'Ways of Working' area. You'll find here information and suggestions about ways of working together, including guidance on facilitating a learning group, essential practical preparations you'll need to consider before you get started and guides to reflective group processes such as worship sharing. You'll also see that there is an outline for a suggested introductory session for any pathway or series of sessions, which you can tailor to fit your needs, and an optional concluding session too. This section offers guidance about essential practical preparations you'll need to consider before you start your learning sessions. This section offers guidance on facilitating a learning group, including general facilitator guidance, more detailed guidance from Hearts and Minds Prepared, a simple, handy checklist for preparing a session, group learning agreements, notes on facilitating a tender issue and notes about support from elders for your learning. 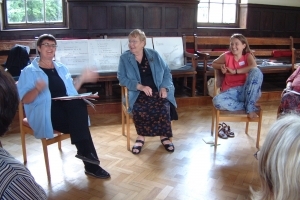 This section includes guides to reflective group processes such as worship sharing, Appleseed, active learning, discussion groups, reflecting on a book, a Quaker Quest style session, a postcards activity, a 'gift squares' activity, chat rooms, the 'Boundaries Game', Appreciative Inquiry, thought showers and using a 'talking stick'. This section includes guides for individual or 1:1 reflective processes including journalling, a creative response using clay or salt dough and working with a spiritual friend or learning companion. This section includes an outline for a suggested introductory session for any pathway or series of sessions, which you can tailor to fit your needs, and an optional concluding session too. You can download group learning agreements from the 'Guidelines for facilitators' section above. Philosophy for Communities is a way of creating a community of enquiry to think and reason together. It provides a group with a structure to participate in rigorous discussion about questions that matter. Equality, integrity and authenticity are core to the method. This resource pack consists of eight sections which together give you an introduction to the approach, its relevance in a Quaker setting, and practical information about facilitating a P4C enquiry. It was developed by Rosie Carnall as part of her Eva Koch scholarship at Woodbrooke in 2018. It aims to provide experienced Quaker facilitators with an accessible introduction to making using of P4C in the Quaker context. It is recommended to experience taking part in an enquiry before facilitating one – email together@woodbrooke.org.uk to find out more about opportunities to do this. “P4C” is used interchangeably for Philosophy for Communities or Children throughout. P4C4Q enquiry plans on a variety of topics.